Michelle Barbero, News Editor| Over the past several years, libraries have been working to adapt to technological innovations. 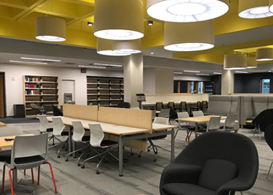 When entering the newly renovated first floor of the James M. Milne Library on the SUNY Oneonta campus, it is evident that the way in which students learn and study has been drastically influenced by the popularity of online learning tools. 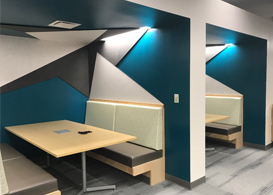 Computer access is necessary for students; homework assignments are now submitted online; quizzes are administered online, even library databases can be accessed on their websites for research purposes and user convenience. To accommodate for the increasing demand in computer and internet access, which comes along with a greater need for outlets, libraries have been getting rid of bulky bookshelves and a decent portion of their hard copy book collections. Because of this, people tend to assume that library buildings are no longer necessary because almost everything that is found in a library can be accessed anywhere there is internet connection. Despite the increase in online learning tools, libraries are still a necessity for the success of students for several reasons. One reason is that not everyone is guaranteed access to a working computer or printer at all times. When it comes to assignments that require printed copies of work of an online submission, teachers expect students to have plan a, b, and c. Excuses based on a technology failure are commonly not accepted. Students rely on libraries for a safe internet connection, a computer, and printer access. Libraries provide a safe space for social interactions, including students meetings for group projects. This type of environment is great for researching in public. There is also an opportunity to share ideas with others that one may have not normally had. This can also help people find others who share similar interests to themselves. These events can also range from teaching younger audiences how to read, all the way to exposing adults to local art. “Public libraries strive to provide collections and services that represent various points of view, and often work closely with local artists to do so,” says Public Libraries Online. Seeing the work of others will allow others to take on new perspectives and maybe even inspire them to create something themselves. Being able to view an art exhibit in person or to hold someone else’s book is very influential. Libraries foster intellectual growth and should continue to be a staple of every community.